“Greetings once again from somewhere over Turkey, It is hard to believe that we are already less than 4 weeks from heading home. Our replacements are due in sometime around the 12th of next month, give them a few days to get oriented and spun up and I would anticipate heading home sometime around the 15th or so. We are currently on our 10th mission and are on pace for 16 before it is all said and done. The patient loads remain relatively small and much to my surprise the number of trauma related patients is down even in the last month we have been here. Of course we still have our share of medical patients, usually contractors who don’t have the best health to begin with. I truly believe that the health screen used by some contract companies is: Have you ever died from a heart attack? Anything more in-depth they might actually discover the uncontrolled diabetes, CHF or even a heart attack that they did survive. None the less it keeps us busy on the flights. During our down time over the past two weeks I had the opportunity to take two very interesting and moving road trips. Our first took us to Bastogne, known to most as the Battle of the Bulge. 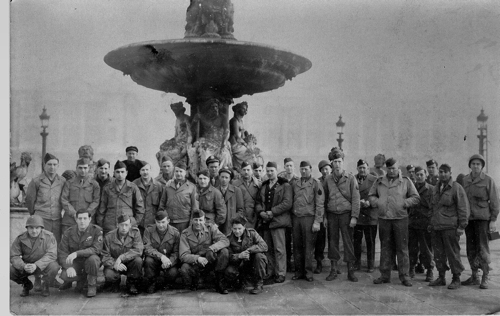 (NOTE: The battle lasted from mid-December 1944 to January 1945). To see it on TV has always been inspiring but to actually go there and walk through the same woods and small villages and to see the monuments was truly great. Over the course of a month back in 1945-6 over 19,000 Americans were killed and another 40,000 wounded, it is truly sacred ground. Our second trip took us to 450 miles to the Northwest corner of France, Normandy. The entire region is so rich in history that it does not take long to realize the prices paid by the “Greatest Generation,” and the toll of blood they shed some 53 years ago. Our first stop was a small village called Saint Lo. My Grandfather’s brother fought in the same town during July 1945 to liberate it. We went on to visit Carentan, the first objective for the 82nd and 101st Airborne Divisions, the Church at Saint Mere Eglise then on to the beaches. First stop was Utah Beach. It had been raining steadily all day since we set out from Saint Lo, buy the time we reached the beach it was torrential down pour. Realizing we still had two more stops we opted to cut this visit short and made our way to Pointe de Hoc. Here the Rangers were tasked with defending the western side of the units that was going to attack Omaha Beach. I have read of some of the ordeals of the Rangers and have seen on TV the cliffs they had to scale just to get up to fight the Germans. That is nothing compared to seeing it in person. Relatively untouched since D-Day, the craters from the initial bombardment, some reaching 10 feet deep, riddle the ledge to this day. Destroyed bunkers and old fighting positions are strewn throughout the ¼ mile long area. From there we headed up the road maybe 4 miles to our ultimate objective, the American Cemetery and Memorial at Omaha Beach. There is a very nice museum located there complete with memorabilia from years past, video accounts of the battle from General Eisenhower and much more. A small hallway connects two exhibition rooms and as you walk through there is a reading of the names of those killed and still missing from the invasions on D-Day. It takes almost an entire day to read through the list. While I was\hoping deep down that the rain would subside for the hour of so we spent inside the memorial it wouldn’t be. Having wanted to make this trip for many years I resolved myself to getting soaked in order to live this moment. As you walk from the museum to edge of the cemetery you come across a statue, “Spirit of American Youth Rising from the Waves”, looking up toward the sky. The inscription on the back reads, “TO THOSE WE OWE THE HIGHEST RESOLVE, FOR THE CAUSE FOR WHICH THEY DIED SHALL LIVE”. For anyone who has been so blessed to visit these 750 acres of hallowedground, they would agree that it not a question of if you will cry, rather when you cry and how many times. Just past the statue are the graves of 9,387 Americans. A generation past who did not know the meaning of fear, defines courage and whose bravery defies common sense. The only bad thing about Normandy is of course that it is in France. The people of Normandy are very friendly, out going and still extremely thankful of what our Fathers or Grandfathers did for them years ago. The rest of France on the other hand, well that is best suited for another email at some other time. Chris’ description brought to memory the many tales of that war that my family recalls. World War II spread to America when Japan attacked Pearl Harbor December 7, 1941. The United States declared war on Germany, Italy and Japan on December 11,1941 and on Bulgaria, Romania and Hungary the following June. My father enlisted in the United States Marine Corps Reserve while a high school senior, and was ordered to the St Louis Military Recruiting Station on November 26, 1942 to be shipped to San Diego Recruit Depot for basic training. He was honorably discharged only a few days later, on Dec 18, 1942, due to a severe allergic condition known as hay fever, or rhinitis, which is caused by pollens of seasonal plants. A person with rhinitis is not well suited for any type of combat duty where exposure to pollens, or dust, could trigger an allergic reaction and subsequent sneezing, which could give away an entire unit’s position, and the only treatment back then was mentholated inhalers, which were not very effective. He returned to his young wife in Hannibal, Missouri and worked as a silk screen press operator at Hannibal Outdoor Advertising, and volunteered for duty with the Missouri State Guard as a radio operator. Many of my early memories about him are from his service with the State Guard and, later, with the National Guard. My grandfather, William Thomas Vaughn, who later became a Baptist minister, served in France during World War I. My father had the photograph below in his personal collection, and was passed on to me by my mother. 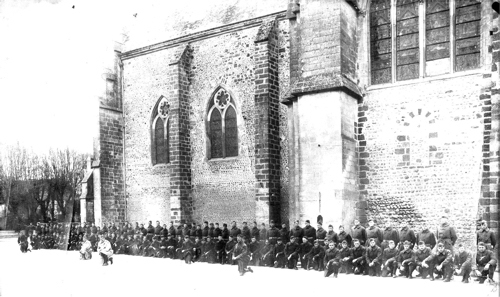 It shows my grandfather’s battalion posing in front of a building, somewhere in France during World War I. Thanks to Chris for his notes on his trip to France. It brought back the reality of the sense of pride we have in all those men and women who have served our country in peace and war, today, and in times gone by. Their names are recorded in history forever. They will never be forgotten. If you are able, could you send a dollar or two, or at least a note, to the address Chris gives above, to provide a little comfort for our sick and wounded troops as they are being transported to Germany for medical treatment? Our prayers remain with Chris and his team for a safe conclusion to their tour of duty and a safe return home to their loved ones.